a couple of times while you exercise your application. Every time I try to add a reference to a Web Service I end up with an empty Reference.cs. NOTE: For some reason I have found that the 7.1 version of the tool crashes with a StackOverflow. I had a hard time trying to get some diagnostics from a RoleEntryPoint. I was doing some setup in this entry point and getting some errors. So I tought, mmmm: this is a Task for the super Azure DiagnosticMonitor. but NOTHING!!! ZERO NILCH! NADA!! This is the things. I had to do. 3. 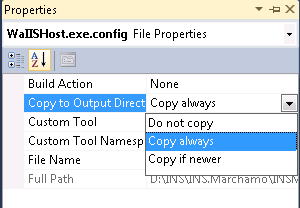 And very very important, you must go to Copy to Output Directory property for this file and set it to Copy Always. 4. And another thing that you need is a lot of patience. The Diagnostics infraestructure takes a while. Well I was trying to create a VM Role for Azure and I got this error from my Hyper-V machine. After some tests I hit my head and got to a clear conclusion: Silly me how could have I missed it. I changed this setting and my VM just worked!! If I was not able to transfer any sense of sarcasm, I think that this is really hard to understand error message. Something simple right! No harm can be gotten from something like that? WRONG!!! After that some of my C++ project stop compiling with the annoying message: Program database manager mismatch!!. Luckily I remembered copying that file, so I just gave it a try, and guest what? Everything works fine now. How do you write a Windows Service in VB6? This is an OCX implement by Mauricio Ordonez some time ago. It is very simple to use. You just drop it on a form and add some code to your VB6.
' Enable interaction with desktop. 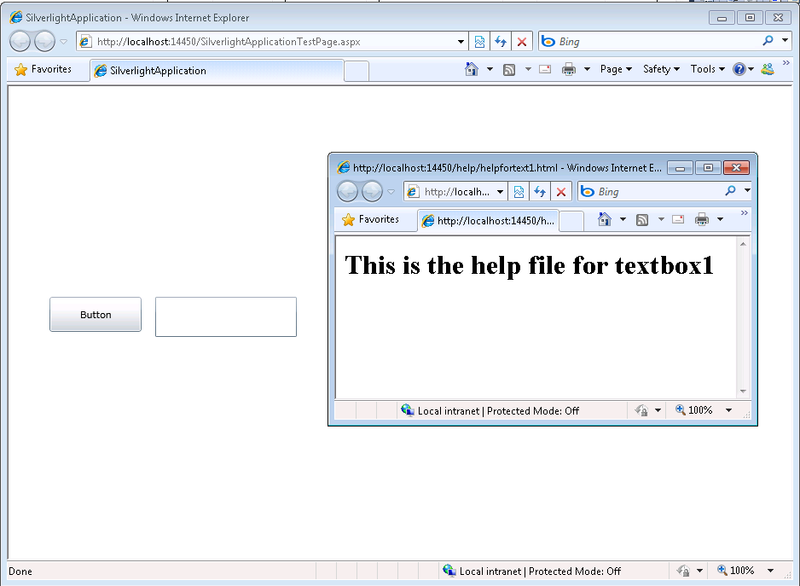 MsgBox strDisplayName & " installed successfully"
MsgBox strDisplayName & " failed to install"
MsgBox strDisplayName & " uninstalled successfully"
MsgBox strDisplayName & " failed to uninstall"
' Connect service to Win32 services controller. How can I convert my VB6 service to .NET? 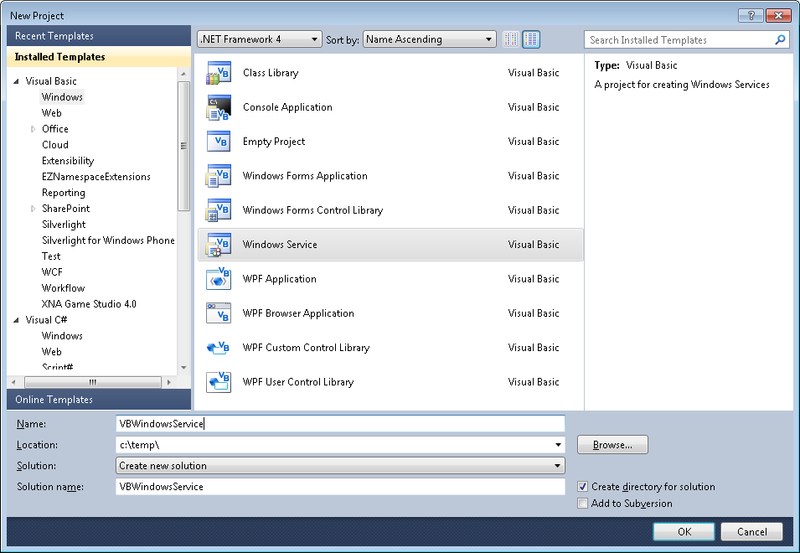 To create a Windows Service in VB.NET follow this steps. b. Go to the File\New\Project….
' in motion so your service can do its work.
' Add code here to perform any tear-down necessary to stop your service. If you need to recover some of your code from your VB6 project, download our Visual Basic Conversion Tool VBUC tool. How do I Install my Windows Service? 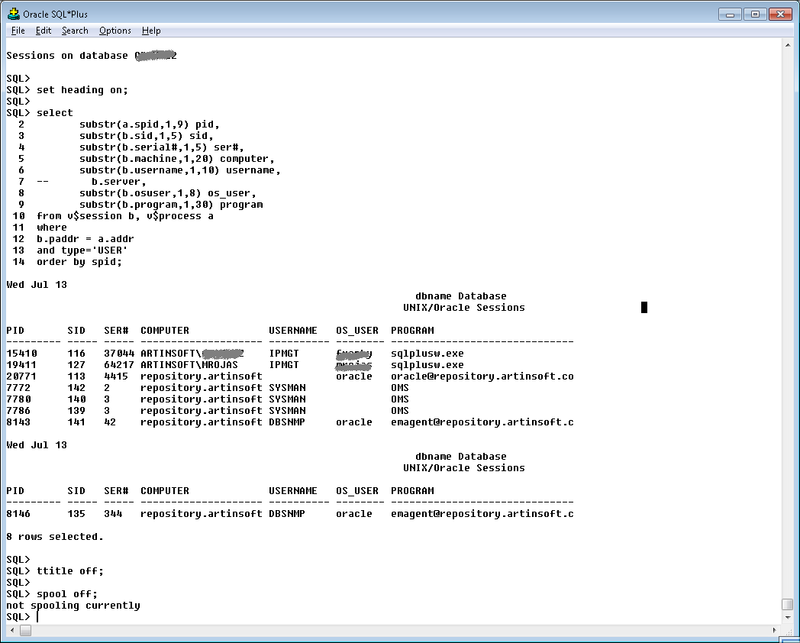 In general you just need to use the command line utility installutil.exe for more details see this other post. to be able to work on mobile devices, and it is a natural thing to wonder. In iOS SQLite is part of the Core Services and you can easily integrate it in your applications. Even in Android you have access to this platform. need you to send data back and for the native API. 3. An attribute must be used on those fields to indicate the field length, for arrays or strings. 4. Extension methods .AsString() .SetFromString and .GetClassLength will handle all the complexities of setting the struct fields. A common doubt when using you want to use Azure Connect is which platforms does it support. you need to install a client pieces of software. But which are the supported platforms. ”Not a valid Win32 application” it means that it is not supported. Windows 2003 and Windows XP are not supported. to put attention to the methods that are used to get the user IP Address. our friend Alex has found that this property can return null or empty. On a previous post I was describing how some basic Objective-C elements were mapped to C#. In particular I showed how the @interface and @implementation definitions are to be mapped in .Net, including basic properties. In this post I will show a little about how methods are migrated. method calls but instead of message sending and that is something to keep in mind when doing this migration. And that example shows properties and methods with no parameter. OK. Now lets just focus on methods with 0, 1 and more parameters. This little example shows some of the particularities of Objective-C.
what is called a label and labels are similar to namedParameter. Ok lets go ahead and map that class. //I just renamed as multiplyTwoNumber2 to avoid compilation errors. So the thing here is what to use as the parameter name, the label or the argument name. In the example you can see the two approaches in the multiplyTwoNumbers case. And calling the methods is simple and the named parameters syntax can be exploited. REMEMBER: This is just a glimpse of some mapping concepts from Objective-C to C#. if the variable will have a value before its use and avoid adding unnecessary if (m!=null) statements. for playing around migrating some Objective-C code. And if it gets too complicated just send me an email!!! and deployment time is also great. You can have all your website up and running in just 10-15minutes. But… and yes there is always a but. you are changing its views constantly. Specially if some ideas are not finished. And yes you can test locally, but there is also a situation where you might want to have that flexibility. like the Windows Azure Explorer modify your web pages without the need of going through a lengthy republish process. 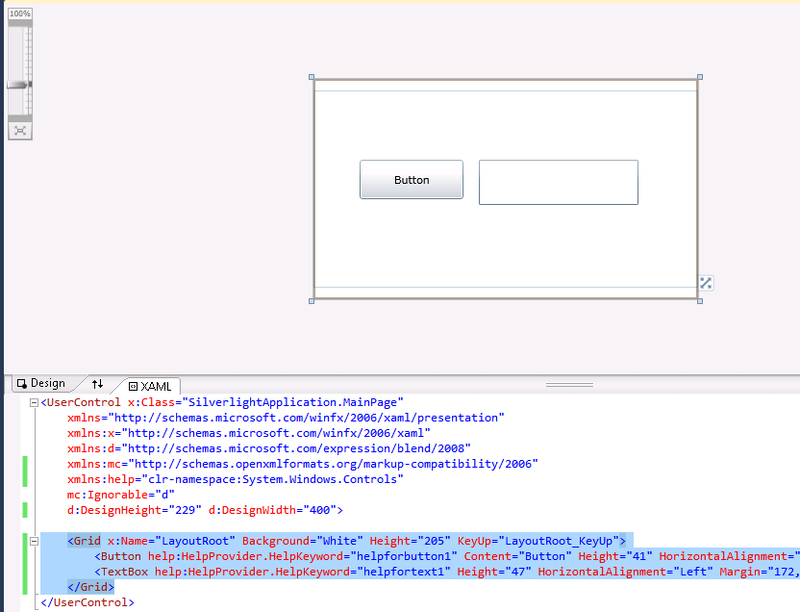 I am glad to have now the option to deploy apps to Windows Phone 7. But we have to recognize that there are tons of great Apps for iPhone already. You might even have some of them. So it’s porting time. Here at Artinsoft we love to upgrade/port application to all platforms. So I will provide here some basic thoughts to help you upgrade your code. For this post let’s discuss a little about applications written for XCode. The code for these methods will be in the .m file. at more Objective-C \ XCode concept mapping to C#. Expression Web 4.0 and it seems to have modified my project files. collect all the information you can about your database. SQL Azure or Azure Storage or Azure Tables. Does my database fits in SQL Azure? Which is an appropriate SQL Azure DB Size? Also remember that SQL Azure is based on SQL Server 2008 (level 100). If you are migrating from an older database (level 80 or 90) it might be necessary to upgrade first. Just look at your db scripts at determine if there are any CREATE TYPE statements with the assembly keyword. If this query has a column value = 1 then it is enabled. Look for calls to sp_addextendedproperty dropextendedproperty OBJECTPROPERTY and sys.extended_properties in your scripts.